Why not book an early holiday or short break to Cornwall, and come and celebrate the early arrival of Spring, (earlier than in most other parts of the UK). Come and visit many Cornish gardens which will be full of fabulous fresh Spring colour, from colourful camellias and ravishing rhododendrums to magnificent magnolias, not forgetting pretty primulas, dazzling daffodils and heavenly helebores. Cornwall really is a gardener's paradise, with many great gardens to visit to enjoy these early blooms. Here are a selection of photos from a walk around the gardens at Pencarrow House gardens, near Bodmin. Combining formal landscaped grounds and woodland walks, there is something for both the garden specialist and casual walker, plus you are also welcome to bring your dog. Also showcasing some of the best of Cornish Horticulture is the Spring Flower Show at Boconnoc on Saturday 28th and Sunday 29th March 2015, with over 100 trade stands, show gardens and gardening experts on hand, offering plenty to see, do and buy. Luxury Holiday Cottage for Two. One of the best way to fully appreciate the rugged, raw beauty of this part of North Cornwall's coastline is to do so on foot, and walking this stretch of the South West Coast Path is truly breath-takingly beautiful. While there are many fantastic local coastal walks, here is one of my favourites, between Trebarwith Strand and Tintagel. This offers dramatic views along the coastline and out to sea, and is not too long (approximately 40 minutes) or too difficult to walk (much of the walk is level, although starting out from Trebarwith Strand you have a steep cliff to climb to get you up onto the coast path). 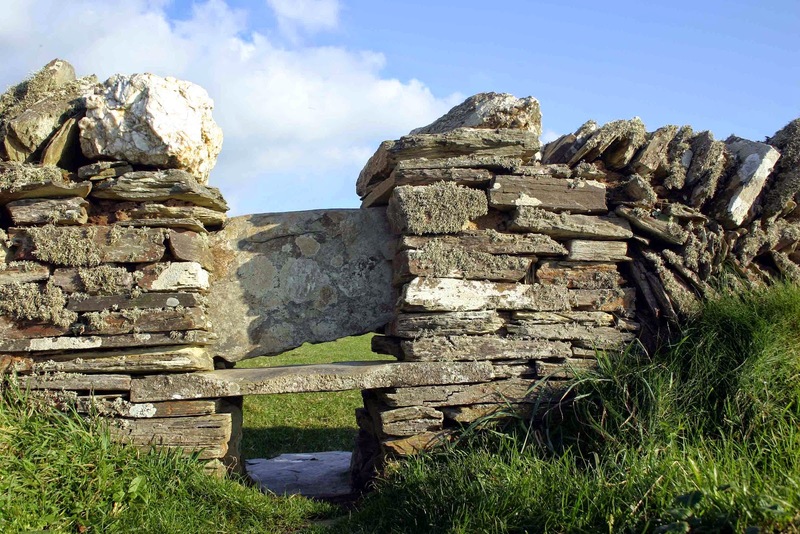 Some local landmarks and 'natural beauties' to look out for along this walk include miles of local stone hedging, 'dotted' with various different types of styles, most of which have been designed to restrict sheep or cattle (and dogs!). While this is an ideal coastal walk with your dog, please keep it under control near livestock grazing in the adjacent fields. Whether 'up and over', or 'down and under', - or even both, (you go over and your dog goes under!) some of these styles can be truly challenging, particularly if you are not especially fit or mobile, but all are fun to investigate. Many of these dry-stone Cornish hedges have been skillfully made using local slate, some with the herring-bone design, others simply stacked, all beautifully patterned and weathered over time, becoming 'objects of beauty' in their own right. Adjacent to the coast path near Tintagel look out for these intriguing ancient grave stones at the St Materiana's church, which stands on the windswept cliffs between Trevena and Tintagel. St Materiana has been identified with St Madryn, a princess of Gwent, who, according to tradition, evangelised this area in about 500 AD leaving this whole site (church and graveyard) steeped in history and religion. Take a few moments to look inside the church where you will find this beautiful stone font, believed to be of Norman origin, and surrounded by a floor of thin slate, laid on its side, in a stunning 'basket weave' design. Imagine the huge number of 'man hours' this took to make, showcasing some truly unique Cornish craftmanship. Unfortunately stonework and laying slate floors like this today is becoming a 'dying art', making it all the more important to appreciate them today. 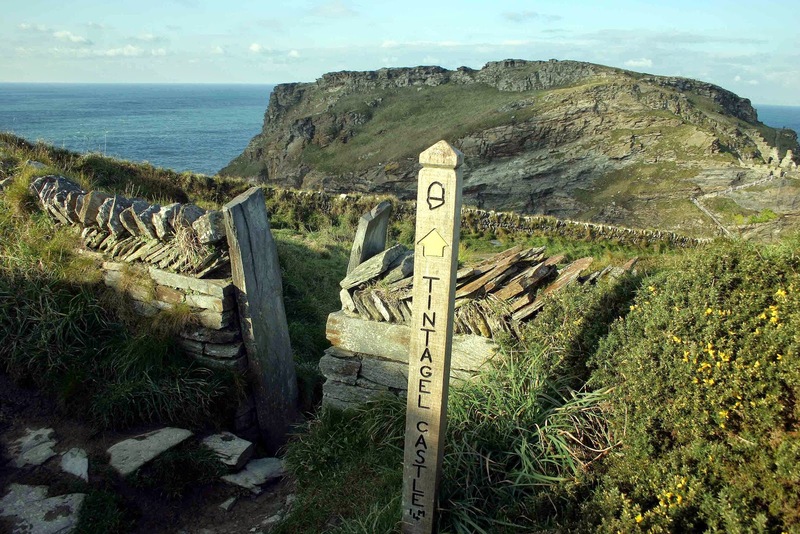 If you fancy, you can then go and explore the ruins of Tintagel Castle, (managed by the National Trust) on the peninsula of Tintagel island. I have always enjoyed 'admiring it' from the coast path, from where you can truly appreciate its fortified position, and the amazing feat of engineering to have originally built it on the cliff edge, with such limited access via a narrow bridge and steep path.